This feature was broadcast on "All Things Considered", a nationally syndicated program of National Public Radio (NPR) in the United States on the date of Rostropovich's death - April 27, 2007. The feature was entitled: "Yo-Yo Ma Reflects on Rostropovich". To hear the voices of Mstislav Rostropovich and Yo Yo Ma and to hear Rostropovich playing his cello, SEARCH at NPR.org. Copyright NPR. Reprinted with permission. Editor's Note: information inside squared parenthesis  has been added for fuller description. 8:18 minute segment. The cellist Mstislav Rostropovich is being remembered as a man of passion, enormous energy and talent. Rostropovich died today in Moscow at age 80. Left: Rostropovich playing at the Berlin Wall. Photo: Wikipedia: New York Times credits Reuters. Melissa Block: Rostropovich told an interviewer several years ago: "All my life I wanted to play music with love to every member of the audience. Even if I have played the Dvorak Concerto thousands of times, every time I reached the final pages, I have tears in my eyes. It is so beautiful." Block: Here he is in an NPR interview from 1991 (Archived NPR broadcast from 1991). Mstislav Rostropovich (world-renown cellist and conductor; former Musical Director of the National Symphony Orchestra in Washington, D.C.): [Rostropovich speaking: exact quote in his broken English]. We realize our talent just this connection, emotional connection to this people. I think for each performer, that's very important how our people who are coming to our concerts, how feel this people? Happy these people or not happy? Rostropovich and his wife [sopranist Galina Vishnevskaya, born 1926] left the Soviet Union in 1974 and were stripped of their citizenship . Rostropovich, whom his friends called "Slava", was musical director of the National Symphony Orchestra in Washington D.C. for nearly 20 years [1977-1994]. And when he returned to Russia for the first time in 1990 [the year before the collapse of the Soviet Union], the first thing he did was go to visit the grave of Dmitri Shostakovich [in Moscow]. 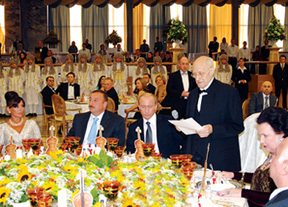 Above left: Azerbaijan's President Ilham Aliyev at the celebration of Rostropovich's 80th birthday in Moscow on March 27, 2007, exactly one month before Rostropovich died. First Lady Mehriban Aliyeva looks on. Credit to Azertaj. 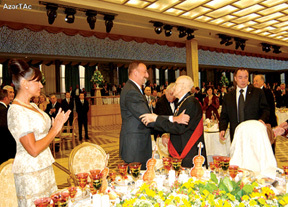 Above right: Birthday guests, left to right: Azerbaijan's First Lady with President Ilham Aliyev, Russia's President Vladimir Putin, Mstislav Rostropovich (standing), with his wife, the Opera Sopranist Galina Vishnevskaya. Credit to Azertaj. It was this1961 recording of Rostropovich's playing a piece written for him by Shostakovich - his first Cello Concerto [Opus 107 in E-flat, 1959] - that electrified a 15-year-old budding cellist named Yo Yo Ma. Yo Yo Ma (world-renown cellist): That recording just made my hair stand on end. I couldn't sleep that night. I think it was the combination of energy - and to a player, a cellist, a fellow cellist - the impossibility of what he was doing on the instrument. Beyond physical ability, there was a kind of will power that was so grand. It was overwhelming. You know, it was kind of a distortion of reality. You enter into that - his sound world - or you see him in person, and something happens and you fall under his spell. Block: You came to work with him many times over the years. Yo Yo Ma: I first met him in 1976, so I've known him for about 31 years. He came to college [Julliard] and gave a Master Class. And boy, he took no prisoners. He immediately zeroed in on my weaknesses and proved to me that I didn't know what was happening in the score, even though I was trying to wiggle out of admitting it. Basically it was one of those things where someone enters your life and tells you the things that other people have been telling you but because it's that person, it makes you pay attention much more. 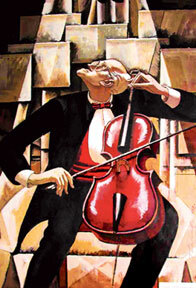 Above: Painting of Rostropovich by Azerbaijan painter Tahir Salahov (born 1928), who is a contemporary of Mstislav Rostropovich. The original, painted in 1999, is on display at the Leopold and Mstislav Rostropovich Home Museum in Baku. And then I played with him at the National Symphony, the following year. Over the years, we would visit each other. He would give me advice about music such as offering a secret program at the Lutoslawski Concerto, which he commissioned. In many ways his generosity was often practical. Just say or do this. You go to a city. This is the way you should play or project. And in that sense, I was very grateful. I still am very grateful for those personal interactions. Block: Was it the kind of thing that even late in his life when your own career had clearly skyrocketed that you were still able to learn things from him? Yo Yo Ma: I think one of the great things about being a musician is that you never stop learning. That reminds me of one of the things Slava used to say. He would say: 'I went to three universities - the universities of Prokofiev, Shostakovich and Britten' [Benjamin 1913-1976]. And it was his deep friendship and his working relationship with these three composers that opened different kinds of world knowledge to him. And I think Rostropovich was always a proponent of continuous learning. I think to the very end, he was premiering new works. It absolutely amazed me. You know, at 51, it's hard for me to learn new pieces, but he would not only learn them, he would memorize them and, of course, ingest them in such a way that, you know, he would own the pieces. As a cellist, we're all so incredibly grateful to him because single-handedly, he changed the landscape of the cello repertoire by adding maybe 40 percent to it. And he taught fabulous students that are inspired artists as well as nurturing teachers. Block: I've been listening to his 1991 recording of the "Bach's Cello Suite," which he recorded in a church in Vezelay, France. And I've been noticing his breathing. You get a sense - at least I do when listening to this - of the huge life force going through him as he plays. Yo Yo Ma: Yes. That life force, I think comes from intention and thought. So it's not just technique but it's much more of what he aimed at - the narrative that he wants us to understand. So playing Bach at the Vezelay Church in Burgundy [France], it's a great wine region, one of the great cathedrals. It's typical Slava that he would record it in such a place. But that recording also is so suitable for Bach in the creation of, essentially, a musical cathedral. But that's because of the way that Slava thought. And I think it's the way that he lived his life. He had a huge appetite for life, and I think what he gives to us in his music is a term that he coined himself. He called himself "a foot soldier in the service of music", and I think of him in that sense as a foot soldier reporting on the triumphs and tragedies of the world. Block: Yo Yo Ma, thanks very much for being with us. Yo Yo Ma: Thank you. Block: Yo Yo Ma - remembering his fellow cellist, Mstislav Rostropovich, who died today in Moscow at age 80. Rostropovich will be buried in Novodevichy Cemetery [Moscow], which also holds the graves of his teachers Dmitri Shostakovich and Sergei Prokofiev. For a guide to Rostropovich's recordings and to watch a video of him playing Bach, SEARCH: NPR.org.